Amazon on Tuesday said it chose New York City and a suburb of Washington, D.C., as the locations for its new headquarters. The Long Island City neighborhood of Queens, just across the East River from Manhattan, and Crystal City in northern Virginia, were selected for the so-called HQ2 by the retail giant after a search commenced last year with 238 hopefuls tossing their hats into the ring. Amazon will invest $5 billion in the new sites, which will create 50,000 new jobs, the company said in a press release. On Tuesday, Amazon started to refer to its northern Virginia site as "National Landing," which surprised and upset some longtime residents, sending shockwaves onto social media. Virginia Gov. Ralph Northam confirmed the renaming of Crystal City in an interview Tuesday on CNBC. Nashville was also picked as Amazon's new "Center of Excellence for its Operations business, which is responsible for the company’s customer fulfillment, transportation, supply chain, and other similar activities," the company stated. Five thousand jobs will be added there. Hiring at these new locations will begin in 2019. In the deals Amazon struck with the cities, the company gained billions of dollars in incentives, in addition to free publicity and valuable data about the 238 cities which initially bid for the company's business. New York will get a Long Island City campus of up to four million square feet, which could eventually rise up to eight million, the promise of 25,000 to 40,000 new jobs, and an investment up to $3.69 billion over 15 years, the company said in its press release. New York could also expect an estimated incremental tax revenue of more than $10 billion over the next 20 years. From its new split headquarters, Amazon is in place to get more than $2 billion in tax incentives, according to the company's statement. New York offered $1.7 billion of incentives if the company does in fact create the 40,000 jobs. Virginia could bestow up to $550 million in cash incentives to the company, that number is also tied to the number of jobs it creates. Tennesee offered $65 million in cash grants if Amazon creates 5,000 jobs over seven years and $21.7 million in state tax credits, also based on the number of jobs created. 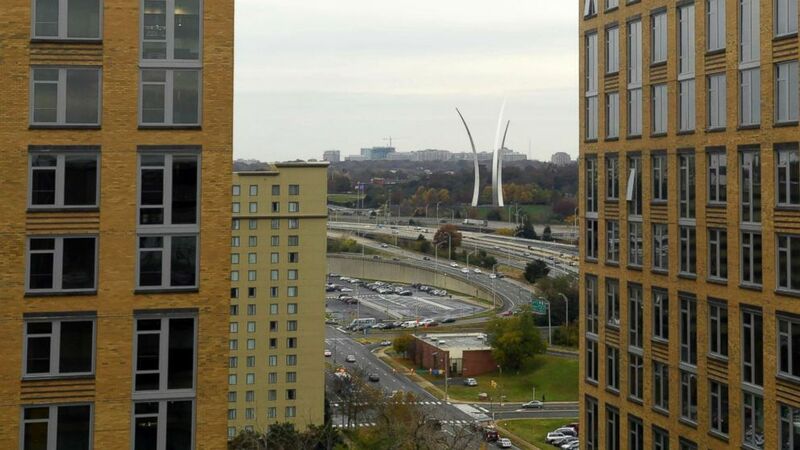 (Susan Walsh/AP) This Friday, Nov. 9, 2018, photo shows a view of Crystal City, Va., and the United States Air Force Memorial as seen from a revolving restaurant. If any place in the U.S. is well positioned to absorb 25,000 Amazon jobs, it may well be Crystal City which has lost nearly that many jobs over the last 15 years. However, many economists say that economic development subsidies don't work, partly because companies have an idea of where they will relocate without such incentives. Amazon, for its part, has said it was hard to find a talent pool 50,000 deep in most American cities. "Amazon's choice is unlikely to be premised on gaining the maximum subsidy from each location. Most recent mega-subsidies of this sort are at least partially structured as proportional to the number of new jobs and size of capital investment, meaning that there's less opportunity for Amazon to double-dip—but that doesn't mean they won't try!" said Michael Farren, a research fellow at the Mercatus Center at George Mason University. "Instead, the decision to split HQ2 seems premised on being able to hire enough skilled workers to support Amazon's stratospheric growth into the future; Amazon wants to be able to hire the best of the best from each location," added Farren, who recently published a study on Amazon's search for its second headquarters entitled, "Amazon HQ2 Is the Only Competition Where the Losers Are Winners." Despite praise from New York Gov. Andrew Cuomo and New York City Mayor Bill de Blasio, both of whom campaigned aggressively for the Amazon project, the announcement was met with local resistance. New York state Sen. Michael Gianaris of Queens and City Councilman Jimmy Van Bramer issued a joint statement saying, "We have serious reservations about the reported deal to bring Amazon to LIC. Offering massive corporate welfare from scarce public resources to one of the wealthiest corporations in the world at a time of great need in our state is just wrong. The burden should not be on the 99 percent to prove we are worthy of the one percent’s presence in our communities, but rather on Amazon to prove it would be a responsible corporate neighbor." Other critics dismissed the 14-month search for a new headquarters as a publicity stunt or an attempt to extract valuable information from cities that Amazon could use to make future decisions that would benefit the company with an unfair advantage over its competitors. "This wasn't a contest, but a con. An elegant transfer of resources (data, time and money) from municipalities to Amazon shareholders. HQ2 will go down as one of the great PR stunts, and abuses of the commonwealth, in corporate history," Scott Galloway, a marketing professor at New York University's Stern Business School, wrote ABC News in an email.